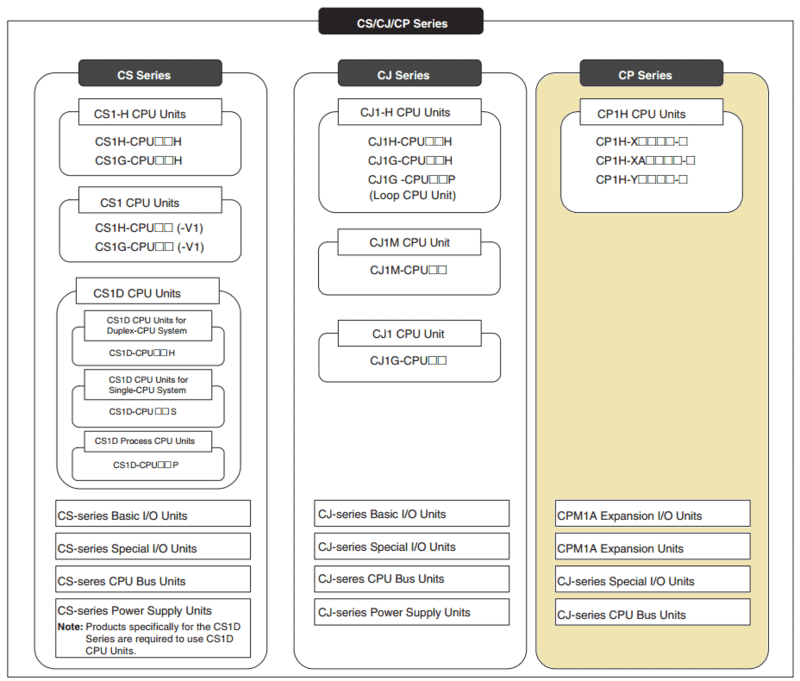 The CP1 series is designed with the same basic architecture as the CS and CJ Series. The special I/O units and CPU bus units of the CJ series can then be used. Always use CPM1A expansions units and CPM1A expansion I/O units when expanding the I/O capacity. The following diagram indicates the position of the unit with respect to the CJ and CS series. 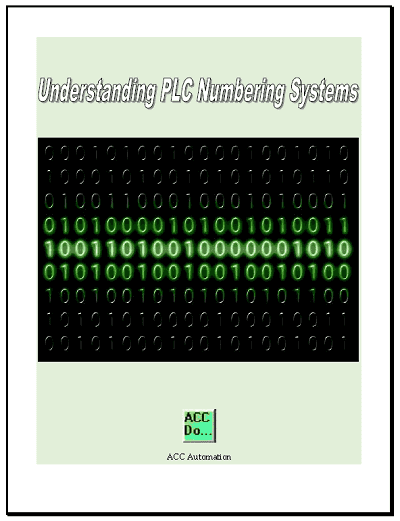 The following is a list of manuals associated with the CP1H programmable logic controller. 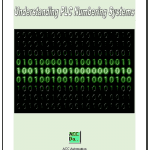 W451 – SYSMAC CP Series CP1H CPU Unit Programming Manual – Programming instructions, methods and functions. W342 – SYSMAC CS/CJseries Communications Commands Reference Manual – Describes commands addressed to CS and CJ series CPU units which include C-mode (Host Link)commands and FINS commands. W446 – SYSMAC CX-Programmer Ver. 6.1 Operation Manual – Provides information on installing and operating CX programmer for all functions except function blocks. W444 – CX-One FA Integrated Tool Package Setup Manual – Provides an overview of the CX-One FA Integrated Tool and installation procedures. W445 – CX-Integrator Operation Manual – Describes CX-Integrator operating procedures and provides information on network configurations. – 8 Interrupt Inputs – Instructions are automatically executed when the input is activated. This will interrupt the current scan, execute the logic in the interrupt routine and then return to the regular scan. – 8 Quick Response Inputs – This is required when your signals into the controller are quicker then the scan of the PLC. These inputs can read signal inputs as quick as 30 micro seconds. – 4 High Speed Counter – 100 KHz single phase inputs from encoders can be inputted directly to the CPU of the CP1H. The XA unit has 4 analog inputs and 2 analog outputs built into the base unit. Here is a quick break down of the part number association of each of the units. Since this hardware has been on the market for a few years you can purchase new and used systems on Ebay, Amazon or similar online sites. 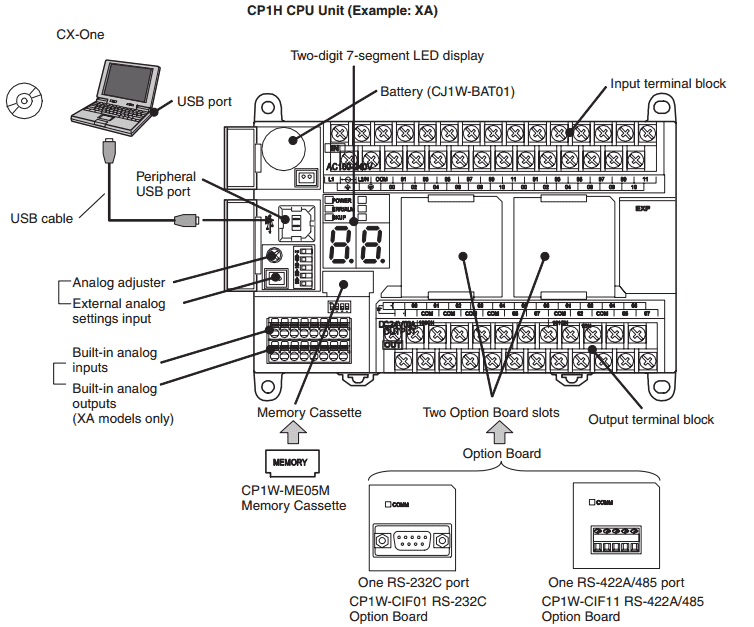 The following is a diagram of the basic configuration of our CP1H-XA unit. Programming Port – The peripheral USB port is used with the CX-One (CX-Programmer) software to program the PLC. This is a dedicated port used only for this purpose. Battery – The CP1H CPU unit saves the backup data in the built-in flash memory (non-volatile memory) enables operation with not battery mounted. However the memory that is memory retentive will rely on the battery to save its values. (HR, CNT and DM Memory areas) The lithium batter is part number CJ1W-BAT01 and will save the information for a maximum of 5 years. External Analog Setting Input – This is similar to the analog adjustor but you will provide an external potentiometer to the connector in order to adjust an analog input. Two Option Board Slots – These are used to attach additional communication units. These can be RS232C or RS422/485 option boards. See this unit and other hardware features by watching the YouTube video below. Next time we will look at CX-Programmer Software.